Born in Latvia, Anatole Wieck received his first musical education in Riga and Moscow. In the United States since 1973, he studied violin and viola at the Juilliard School of Music in New York City, where he completed his Doctorate in Musical Arts working closely with Ivan Galamian, Lillian Fuchs, and Paul Doktor. He also studied baroque interpretation with Carol Lieberman at Boston University. He plays baroque viola, viola d’amore and baroque violin. 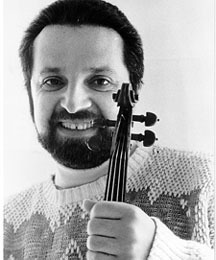 Since 1986 Dr. Wieck has taught upper strings at the University of Maine and conducted the University of Maine Orchestra. He has performed and conducted in Europe, North and South America, and has participated in chamber music festivals such as Chamber Music/West (San Francisco), White Nights (St. Petersburg, Russia) and festivals in Montepulciano, Italy and Newport, Rhode Island. Dr. Wieck also performed for Baroque Chamber Music festivals in three cities of Spain: Castellón de la Plana, Valladolid and Vitoria. He has collaborated with Jaime Laredo, Sharon Robinson, Eric Friedman, Bela Davidovich, Shlomo Mintz, and others. In May, 2006 he traveled to Guatemala as a Fulbright Senior Specialist where he conducted the Juventud y Música Foundation orchestra, gave master classes to students and faculty of the Guatemala National Conservatory, and played recitals, and was invited again in the Fall of 2007. As a member of the Ad Libitum Ensemble that specializes in Baroque music, Dr. Wieck toured Israel in December 2007. In April 2008 Dr. Wieck performed at Carnegie Recital Hall in New York City in a concert dedicated to the music of Iosif Andriasov. Between 2009 and 2012 he traveled five times to Mexico to teach, perform, and conduct. Dr. Wieck collaborated with Artes Revueltas, the music school founded by his Master student Augusto Bertado. In the spring of 2013 Dr. Wieck performed and taught in Japan as a soloist and chamber musician. Dr. Wieck performs regularly with BOOM (Baroque Orchestra of Maine) formed in 2010 and is director of the String Program at MSYM (Maine Summer Youth Music), which takes place every summer at the University of Maine. In the summer of 2016 Dr. Wieck, Dr. Barrett, trombone professor, and six University of Maine students traveled to southern Italy where they spent a week studying and performing with experts in late Renaissance and early Baroque music. In 2010 Dr. Wieck co-founded the Chamber Music Institute (CMI) with his Juilliard classmate Akiko Hirose-Silver, a successful teacher and performer. Each summer CMI welcomes some 30 chamber music students from around the world, whose ages range from nine to 22.